HURRICANE — The sixth annual Sand Hollow Marathon will take place Saturday starting at 7 a.m. and will feature runners from all over the country and parts of Canada. “Of course that is self-proclaimed,” Mathisen said of his course description. Though it is not a downhill course, what it lacks in relative ease, it more than makes up for in breathtaking views and a small-town intimate feel, Mathisen said. This year’s race has about 150 people signed up to tackle the beautiful course in three divisions; full marathon, two-person relay and wheelchair/hand cycle division. 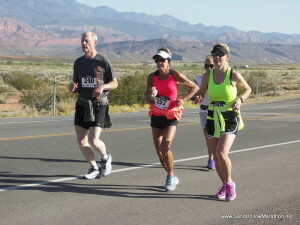 One of the unique features of the Sand Hollow Marathon is the option of a two-person relay for those who only want to run a half and have fun with a friend, Mathisen said. Competing in the hand cycle division is Travis Wood, a teacher in Cedar City and Afghanistan veteran who lost his legs in the service, Mathisen said. As a tribute to his heroism, the hand cycle division award has been named the Travis Wood Award and future hand cycle participants will have the opportunity to compete to win the prestigious award. Hurricane Mayor John Bramall will start the race which begins at the Hurricane Community Center, 63 S. 100 West at 7 a.m. Packet pick up will take place Friday from 6-9 p.m. and again Saturday from 6-6:30 a.m. at the Hurricane Community Center. The race is sponsored by Jones Paint and Glass, a company that Mathisen credits with helping keep the race going year after year. Racers will receive on-course support, finish line refreshments, a quality shirt and beautiful race medal. “Everything we do is geared toward a great running experience,” Mathisen said. When: Saturday, March 19, 7 a.m. start | Packet pick up: Friday, March 18, 6-9 p.m., Saturday, March 19, 6-6:30 a.m.